440-C stainless blade is 3-5/8" long. Closed knife: 4-1/4"
Stainless frame and file worked back spring. Gold lip mother of pearl scales. ATS-34 stainless , satin finish blade is 3-3/4" long. Closed knife:5"
Anodized Titanium frame, spine button and screws. Knife was made in 90's in what was known then as hi- tech category. Ats-34 blade is 3-1/2" long. Closed knife: 4"
Stainless steel engraved frame and locking bar. Buffalo horn inlays. Upper front panel release. Works nice and locks solid. 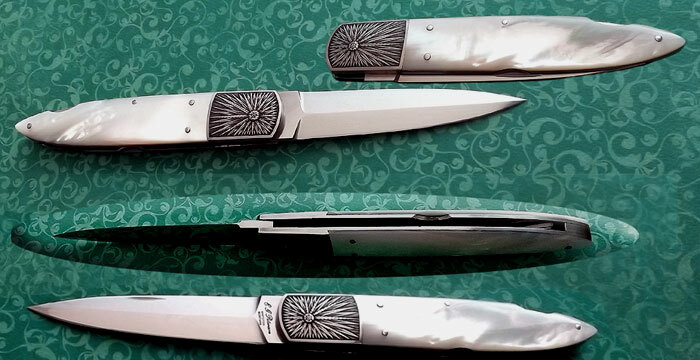 Damascus bolsters , anodized titanium liners, carved back spine. Gold inlays on the spine, gold thumb stud with red garnet . Back spine has gold inlays and some carving of rattlesnake inside. 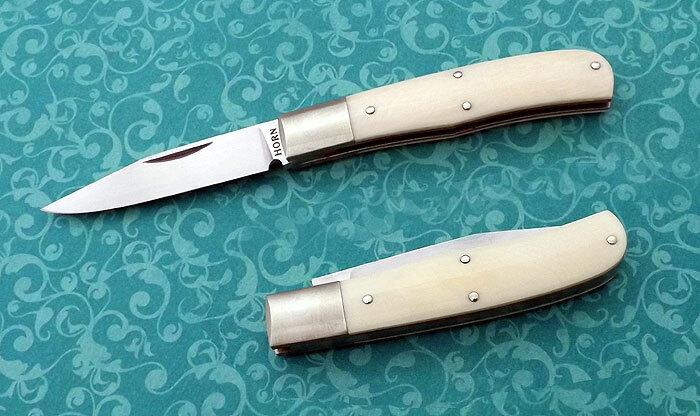 "Rattler" was Ralph's pseudonym in knife making world and is signed as such inside of spine as well. Custom made screws ,crushing spike at the end and the very precise locking mechanism puts this knife on the "top shelf". ATS-34 blade is 3" long. Closed knife:4"
Heath blued Damascus blade is 3" long. Closed knife: 4"
Damascus heath blued frame and file worked back spring. 14K gold thumb stud and pins. 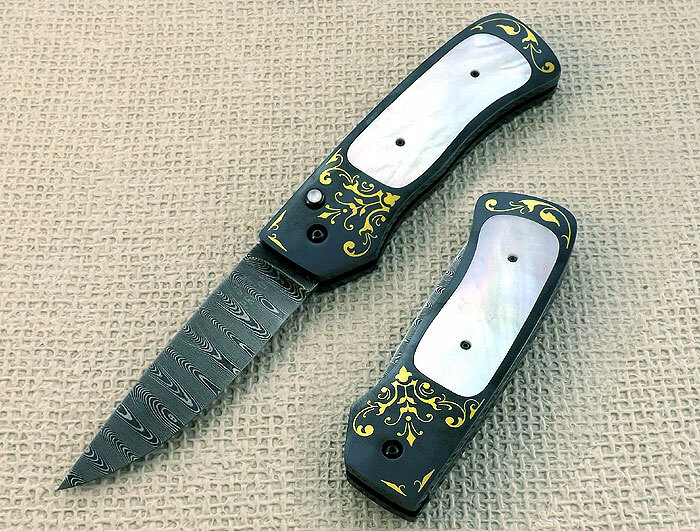 Mosaic damascus blade is 2-7/8" long. Closed knife: 4"
Mosaic damascus bolsters, anodized titanium liners and file worked back strap. Damascus Blade is 3-1/4" long. Closed knife:4-1/4"
Damascus bolsters, anodized titanium liners and file worked back strap. Damascus blade is 2-3/4" long . Closed knife:3-1/2"
Gun blued stainless frame inlayed with gold by Joyce Minnick. Hot blued damascus blade Is 2-1/2" long. Closed knife: 3-1/2"
hot blued damascus bolsters with gold inlays. 14K Gold thumb stud and gold plate screws. Titanium file worked liners and back strap. Fossil ivory scales. Damascus blade is 3" long. Closed knife : 3-3/4"
Damascus frame. Gold thumb stud, pins and inlays on the blade. Gold and pearl inlays on the back spring. Damascus blade is 2-3/4"long. Closed knife: 4"
Meteorite bolster and locking bar. Black and gold lip mother of pearl scales. 14K gold plate screws . Stainless steel liners and file worked spine. Damascus blade is 3" long. Closed knife: 4-1/4"
Meteorite bolsters, anodized titanium liners and file worked back strap. ATS-34 stainless blade is 3" long. Closed knife: 4"
Anodized titanium frame liners, screws and thumb stud. Antique tortoise inlays. Unique locking mechanism characteristic of the many Leon's folders. Works and feels very precise and has "hi tech" look. Knife was made at least 15 years ago. ATS-34 blade is 3-1/4" long. Closed knife:4-3/8". Titanium textured and anodized bolsters and liners. Fossil ivory scales and back strap. ATS-34 blade is 4" long. Closed knife: 5"
Stainless frame and file worked back strap. Abalone inlays in the handle and button. Coil spring with quite the kick. Stainless steel blade is 3-3/8" long. Closed knife: 4-3/8"
Stainless frame and back spring. Malachite inlays. Damascus blade is 3-7/8" long. Closed knife: 4-7/8". Titanium engraved frame, file worked spine and liners. M.O.P. inlays. Ruby in the thumb stud. Damascus blade is 3-3/4" long. Closed knife is 4-1/4" long. Damascus bolsters. Fossil scales. Titanium liners, file worked back. Stainless blade is 3-3/8" long. Closed knife:4-5/8". Stainless bolsters, liners and back lock bar. Mother of Pearl scales. Knife is engraved by Dan Goodwin - Colt Master Engraver. Stainless 440B blade is 4" long. 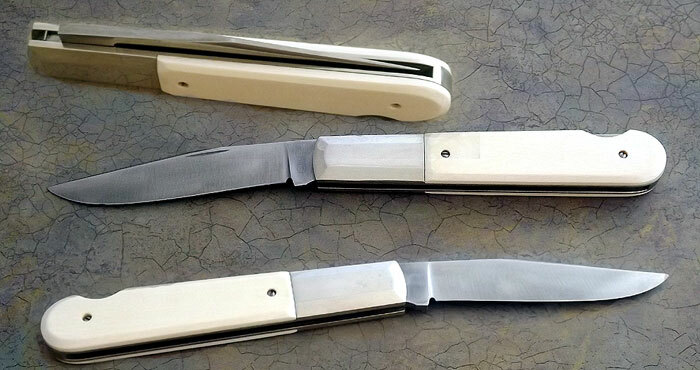 Closed Knife:5-3/8" Nickel-Silver bolsters and liners. Walter Grigg was a Randall employee and the knife was sold through Randall catalog in 1981-82. Signature: Grigg Hand Made. 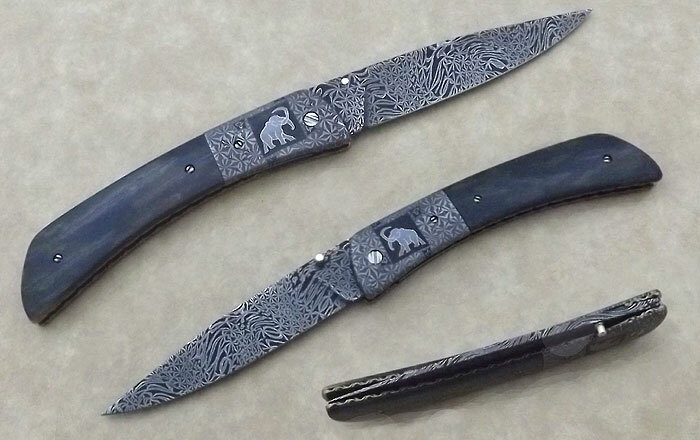 Mosaic Damascus bolster has image of mammoth in the center. Titanium liners are file worked. Thumb stud and all screw are gold. 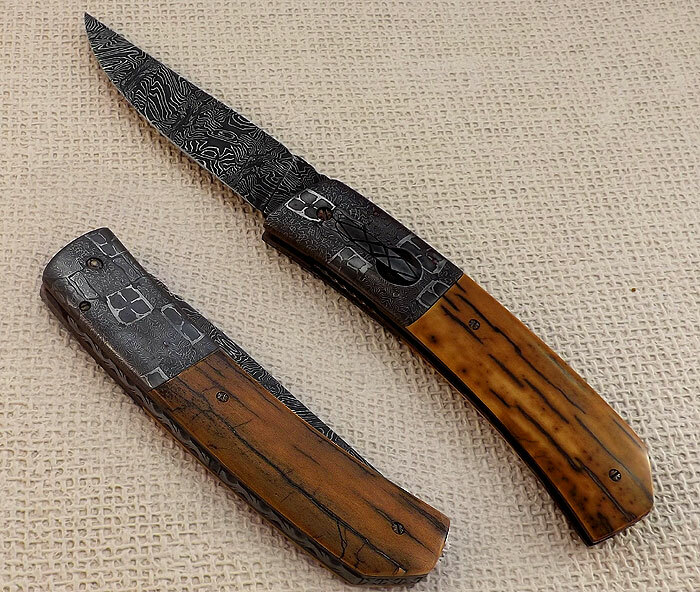 Damascus blade is 2-13/16" long. Closed knife is 4" long. Damascus bolsters. File work and inlays on the back. File worked blade. Inlay in the thumb stud. Blade length: 4-1/4".Closed knife: 5" Damascus fighter blade, carved mosaic Damascus bolsters. Carved, gold lip pearl scales. Semiprecious stone in the thumb stud, file worked back. Blade length: 3-1/4". Knife closed 4". 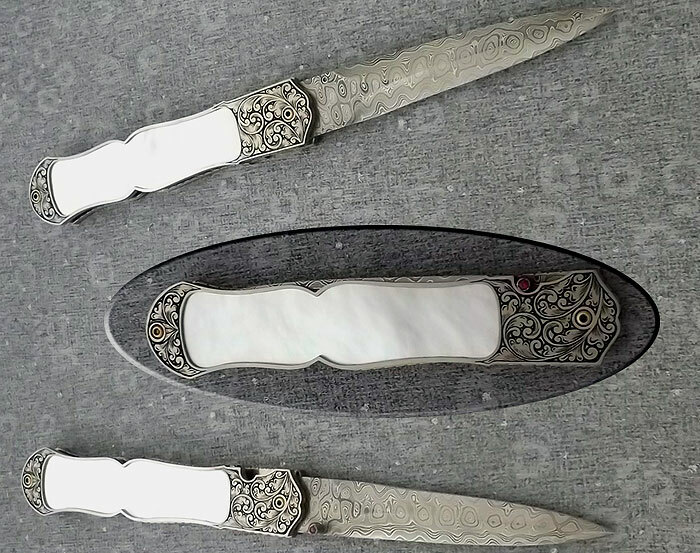 Carved Damascus bolsters and pearl scales, Semi-precious stone in the thumb stud, file worked back. ATS-34 blade is 2-1/2" long. Closed knife; 2-7/8". Nickel silver bolsters and pins.